While the Commission faced significant limitations with respect to its ability to witness information first-hand, it relied on interviews, meetings with victims, civil society, government officials, and witnesses; it also collected thousands of documents, including medical reports, expert legal opinions, drone footage, and written submissions, among others, to support its findings. See id. at paras. 19-21, 30-36. The Israeli government has since issued a statement rejecting the report’s findings and accusing the Commission of bias against Israel. See Israel Ministry of Foreign Affairs, Israel’s response to UNHRC Commission of Inquiry report, 21 March 2019. The report provides historical context of the unfolding demonstrations, beginning with the situation in Gaza from World War I to the Israeli blockade and the United States recent decision to move its embassy to Jerusalem. 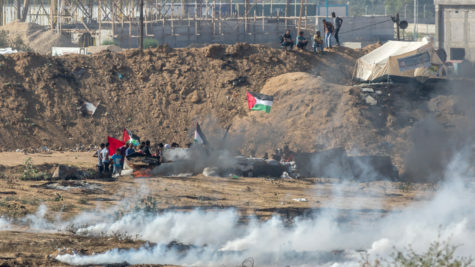 See Report of the detailed findings of the independent international Commission of inquiry on the protests in the Occupied Palestinian Territory, 18 March 2019, paras. 119, 192-99. Beginning on March 30, 2018, mass popular demonstrations have been taking place on a weekly basis in the Gaza Strip with the goal of “achiev[ing] the return of the refugees who were displaced in 1948 to their land, homes and properties” and ending the Israeli-imposed blockade on Gaza. See id. at paras. 201-02. While the organizers of the mass demonstrations — commonly referred to as the “Great March of Return” — aimed for a “fully peaceful [demonstration] from beginning to the end,” the human toll over the time period observed in the report stands at about 189 Palestinian deaths and over 6,000 more wounded or injured by live ammunition at the demonstration sites. See id. at paras. 114, 202, 402. These figures do not include those who died and were injured by bullet and bone shrapnel that resulted from the use of high-velocity live ammunition, or direct hits with tear gas canisters or rubber-coated metal bullets. See id. at para. 402. Among those targeted were children, women, disabled persons, journalists, and medics. See id. at para. 95. The Commission finds that there were no Israeli civilian deaths or injuries during this time period resulting from the protests. See id. at paras. 90-92. However, four Israeli soldiers were injured and one Israeli soldier was killed while the demonstrations were ongoing. See id. at para. 402. The Commission’s findings indicate that Israeli security forces killed and wounded demonstrators “who did not pose an imminent threat of death or serious injury to others.” See id. at para. 885. Its findings also indicate that while Palestinian demonstrators engaged in some violent activities, such as throwing of stones, using incendiary kites and balloons, burning tires, using cutting tools to destroy barbed wire and fencing, and attempting to breach the security barrier, these activities did not constitute an imminent threat to the lives of either the Israeli security forces or the Israeli civilian population. See id. at paras. 320, 344-75, 885. In analyzing the situation, the Commission applies international human rights law (IHRL), international humanitarian law (IHL), and international criminal law (ICL) in the context of the demonstrations and the ongoing Israeli occupation of the Gaza Strip. See id. at paras. 37, 55. The CoIOPT determines that an armed conflict exists between Israel and Palestinian armed groups because of the military-style attacks launched by the parties during certain periods. See id. at para. 68. As such, the CoIOPT concludes that while the conflict may be considered international or non-international, the laws of armed conflict and standards related to the use of force under IHL apply. See id. at paras. 67-69. Additionally, the report emphasizes that IHRL applies concurrently when IHL applies, citing the International Court of Justice (ICJ). See id. at paras. 80-81. Relying on the ICJ’s approach in the Legal Consequences of the Wall Advisory Opinion, the Commission considers two legal paradigms to determine the legality of the use of force against demonstrators: relevant standards under the IHRL-based “law enforcement paradigm,” and the IHL-based “conduct of hostilities paradigm.” See id. at para. 83. The CoIOPT outlines the applicable standards under both of these paradigms, and determines that “[u]nder the IHRL-based law enforcement paradigm, lethal force must not be used against an individual who does not pose an (i) imminent threat to life or serious injury, and the force used must be pursuant to a (ii) legitimate law enforcement objective, (iii) necessary, and (iv) proportionate. Under the IHL-based conduct of hostilities paradigm, individuals must not be targeted unless they (i) were directly participating in hostilities, and only if the targeting complied with the principles of (ii) distinction, (iii) proportionality, and (iv) precautions in attack.” See id. at para. 310. When assessed against these standards, the Commission found that the Israeli security forces’ violence and use of force against the demonstrators was disproportionate and unnecessary, and not in compliance with the principle of distinction given that the demonstrators did not pose an imminent threat to the lives of either the Israeli security forces or the Israeli civilian population, and that it resulted in loss of life of women and children. See id. at paras. 391-401. The Commission emphasizes that the use of force against demonstrators, even during an armed conflict, will rarely satisfy the principles of distinction, proportionality, and precautions, thus it will be unlawful in most circumstances. See id. at para. 401. Additionally, the Commission concludes that the policy of shooting unarmed demonstrators based on their actual or suspected membership in a militant group is prohibited by human rights law, even in armed conflict. See id. at para. 106. With respect to the Israeli security forces’ rules of engagement, the policy document guiding the Israeli security forces’ response to the demonstrations, the Commission highlights in particular the use of live ammunition against those deemed “key rioters,” a broadly defined term in the rules of engagement which provides criteria for determining who may be targeted. See id. at paras. 314-27. Based on the scale of the damage, the Commission notes that in this situation, Israeli forces may be guilty of crimes against humanity, an international crime that would make individual Israeli perpetrators criminally liable for their actions toward the demonstrators. See id. at paras. 73-77, 981-83. In addition to the general recommendation that both parties, Palestinian and Israeli, take measures to ensure the respect for the rights of all civilians in accordance with their international human rights and international humanitarian obligations, the Commission makes specific recommendations to the Israeli government, the relevant Palestinian authorities, UN Member States, and the UN High Commissioner for Human Rights. See id. at para. 984. In order to prevent future violations at demonstrations and to protect civilians on both sides, the Commission recommends that Israel “[r]efrain from using lethal force against civilians, including children, journalists, health workers and persons with disabilities, who pose no imminent threat to life.” See id. at para. 985. Additionally, it recommends that the State of Israel eliminate its policy of targeting people under the categorization of “main inciter,” and targeting individuals based solely on their affiliation or alleged affiliation with any group. See id. It also recommends that Israel end the blockade of the Gaza Strip and allow Gazans to access hospitals outside the Occupied Palestinian Territory, and to ensure that medical professionals and humanitarian workers have access to those injured. See id. at para. 989. With respect to accountability, the CoIOPT recommends that Israel investigate and provide compensation and other remedies for victims. See id. at para. 992. The Commission also recommends that Palestinian authorities stop the use of incendiary kites and balloons, ensure the right to freedom of assembly, refrain from using excessive force against Palestinian demonstrators, and work to coordinate entry of medical supplies into Gaza. See id. at paras. 986-87, 990. Finally, the Commission recommends that the UN High Commissioner for Human Rights ensure that the cases of alleged perpetrators of violations are taken up in the relevant international and domestic courts, including the International Criminal Court, and undertake their own investigations. See id. at para. 993. Relatedly, it advises States parties to the Rome Statute of the International Criminal Court to exercise their criminal jurisdiction and take measures to arrest those allegedly responsible for the crimes described in the report. See id. at para. 995. It also recommends that UN Member States consider imposing individual sanctions against those identified by the Commission to have committed violations. See id. at para. 994. For more information on UN human rights mechanisms, international humanitarian law, or international criminal law, visit IJRC’s Online Resource Hub. To stay up-to-date on international human rights news, visit IJRC’s News Room or subscribe to the IJRC Daily.